We've already been inspecting most of our hives and have been optimistic about their progress through the winter and into spring. Yesterday we got the chance to inspect the last three which hadn't been opened this year. Surprising doesn't really cover it! The first hive we inspected was number 16. The sheer number of bees was incredible - they're doing really well. It's really full and we shall be looking to put a super on them soon to give them more space. 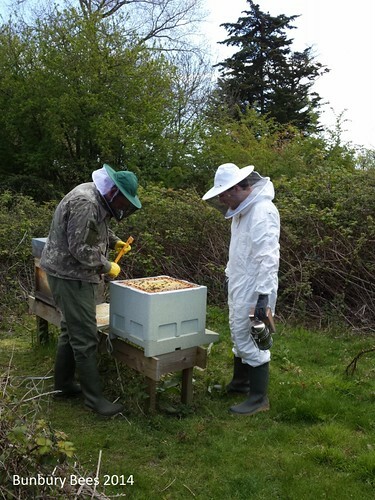 Beekeeping was a team effort as we were accompanied by our friend Henry, as well as Amanda and Jamie. Amanda received a bee suit for Christmas and this was her first chance to get it dirty. Beekeeping is not a particularly clean and tidy operation. Luckily for me, having so many pairs of hands around to help meant that I was free to take photos. The girls were very tolerant as I got up close and personal with my phone to take some shots. I like to make the most of it, because as we get busier my chances to do this will be less and less. So, first inspection done and all looking very positive. On to the next hives, which were moved here last week from one of our Newport apiaries due to some building work taking place. Both hives showed signs of bringing on new queens, so we performed artificial swarms with them both. 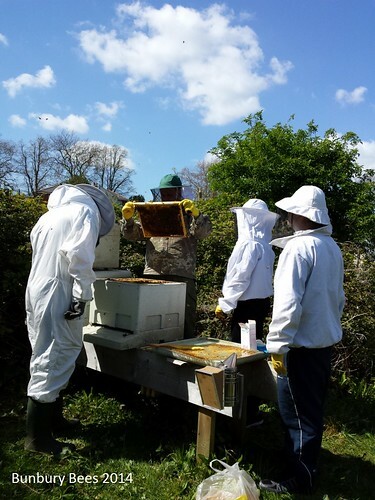 This involves taking the existing queen out, putting her into a smaller hive (a nuc), then leaving the nuc in place and moving the old hive with bees in to another spot. All the flying bees should then return to the nuc, so we will be left with half the bees in each hive. It sounds straightforward, but the most complicated bit is finding the existing queen to move her. Sometimes queens are really easy to spot, but neither of these wanted to be found and we had to go through both hives several times to catch them and this took quite a while. One split was fairly straightforward, so now we just have to wait and see what happens with the new queen. The second split was a bit more complex, as the queen we removed looked very small - possibly a virgin queen. This suggests that the old queen had died and the bees had replaced her. 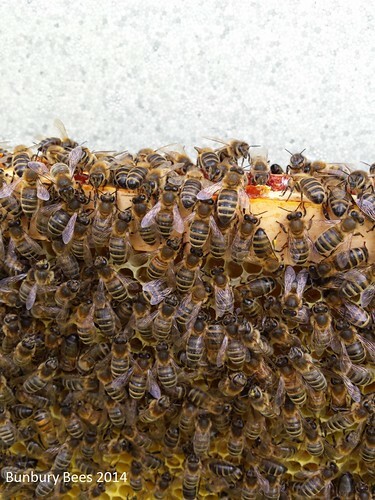 However, there were still queen cells with eggs, so we risked either the new queen destroying her competition, or another queen hatching and the bees swarming away. Doing an artificial swarm like this will hopefully give us the best chance of keeping all our bees. 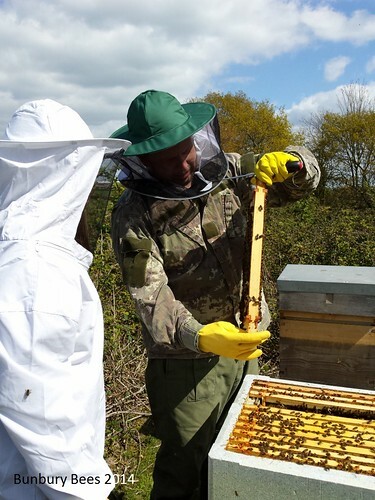 This all took much longer than we were expecting, but it had been a great introduction for our new beekeepers and a great chance for them to see lots of action. But the day wasn't over yet! 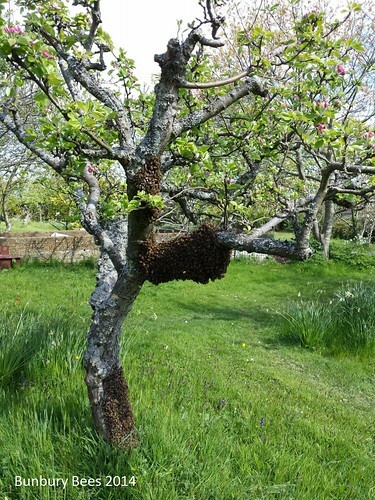 Chris' phone rang several times as we were packing up, so he returned the call to be told 'we've seen a lot of bees flying at the bottom of the garden.' You can never be certain about swarms unless the person calling you is a beekeeper, but as we weren't far away we popped along to have a look. Oh my. 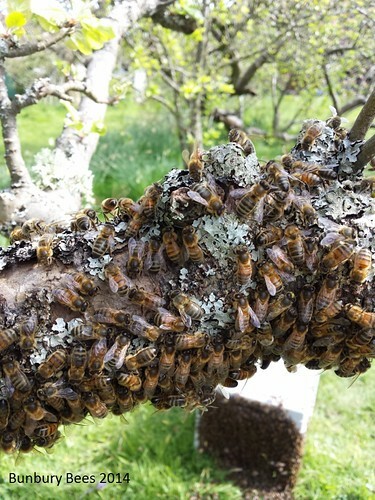 A huge swarm of bees on the same tree that we collected most of our swarms from last year. 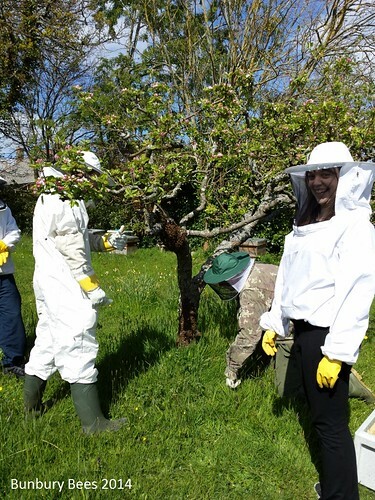 Another team effort - we all took turns in brushing the bees off the branch and into the nuc. 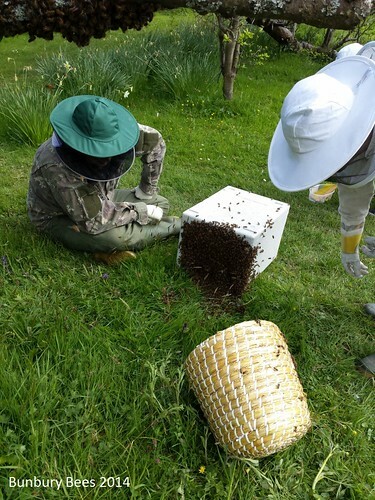 There were certainly plenty of bees for us all to have a go. Once most of the bees get the idea then they will sort themselves out, but there were a lot of bees trying to go through a very small entrance so it did take some time. The bees are all very calm, though, and I'm probably the least likely to get stung here than I am at any other point. For a bee to sting they have to bend themselves in half, but before swarming they've already stuffed themselves full of honey, so they really can't bend very easily. I did get one try and sting my leg, but that was mostly because she got caught up in my trousers rather than any real anger.